/ First time chart posting... feedback? First time chart posting... feedback? First time posting any data here for comment. I have tried as best I could to make the chart look as suggested. I am data-number ignorant and have absolutely no idea what it means. I have an appointment scheduled with my doctor upcoming and need to become better educated when talking to her. Is this data "good?" i thought/ think I am doing OK using CPAP- it is not uncomfortable to wear and I think that I am sleeping very well throughout the night by the fact that I am sleeping in one position all night- I do wake up at least once to take a leak, BUT... I feel very tired still when I awake in the morning. RE: First time chart posting... feedback? That pressure is working for you, zero OA/H is as good as it gets. I think the CA are being stirred up by the 'new user pressure response syndrome' NUPRS (yes, I did just make that up) and should settle in a while. I would work on your leaks for now. next time I would set the chart up by removing the pie chart and use http://imgur.com/ for a clearer image. I am probably missing a lot. Thanks for the initial feedback. Probably a lot of noob questions on my part. I have been a CPAP user for about 8 months or so and have been more or less lurking before diving into advice, recommendations, etc here. I am still getting up to speed with all the acronyms and such and now that comments with initials are being used in reference to my question I can now identify more with them. In respect to NURPS, I think I am over that. I remember the first couple of weeks I think I sensed this syndrome and it was about the third week that wearing a nasal pillow mask was effortless and almost felt non-existent on my face. Even now, I still feel absolutely no discomfort wearing a device. I have been told by more than a few people that I am lucky to have been able to "adapt" to it. As to the "CA" comment- Does this acronym mean "clear airway?" What specifically does clear airway mean? Is it that I am coughing during the night? Mentioned above is that I should "work on leaks." I use the P-10 pillows and as I see it there is only one way to minimize leaks and that is to adjust the headgear to make the pillows tighter against the nostril opening. I will tighten to see if it makes a difference. I am surmising that I want to see less indicators on the Leak Rate chart. Ajack- you state "It is suggested to initially set the max APAP pressure higher (1 or 2 cm) than the 95% pressure. The minimum a little lower than the median pressure. " Just so that I better understand this comment, do you base this on the data in my "Pressure" chart? Is APAP pressure the data that shows up as the Pressure Therapy in that specific chart? If so then I will further analyze the suggestion in order to better understand. UARS- (Upper airway resistance syndrome) This is a new one to me... I need to read more of what but by definition it seems to be another physical symptom that can cause apnea. Low vitamin D- My allergist recommended to me to take supplements. I have sorta' slacked on this in recent weeks (months) Perhaps I return to it. PLMD- (Periodic limb movement disorder) Interesting that you mention this- I think I may have the opposite! I think I am NOT moving my limbs because I think I am sleeping reasonably well. I have noticed that since I am a predominantly right side sleeper that my right arm is very sore in spots. I feel what seems like a tendonitis in my inside forearm near the elbow. I know that I think I force myself to awake to readjust my arm when I feel this pain flare up at night... but my initial reaction to this comment is that I think I am more more stable in my limb movement and not involuntary. I will ask my doctor more about this. Low thyroid function- Good question that I will ask the doc. I am seeing on my chart a term called "RERA" in the Event Flags category. I need to learn more about this. Thanks for the feedback comments. Yes, CA = clear airway is that you stop breathing, but unlike obstructive apnea, your airway is open. There can be lots of reasons. Regardless of the cause, .68 an hour wouldn't rate a mention, Given you have been on cpap for 8 months, they will probably stay and are just a part of you. your pressure is working, there really isn't a need to do anything.. As to my signature, that refers to the sleepyhead charts that are recommended to use for auto mode, For an experiment, put your machine into auto and set 6 as a minimum and 10 as a maximum and see the results. the results will show your median and 95% pressure range. There are links at the top of the page to your machine manual. Bonjour has a link to mask fitting in his signature. Your machine also has a mask fit function, that will blow higher pressure air to help fit it. Mouth breathing may be another cause of leaks. I have PLMD, If you have it you won't be aware of it, it's a twitch every few minutes that arouses you. It is picked up in a sleep study, some video themselves to see any movement. ajack has a signature line, that appears on every post, so that comment is not about your data. "It is suggested to initially set the max APAP pressure higher (1 or 2 cm) than the 95% pressure. The minimum a little lower than the median pressure." 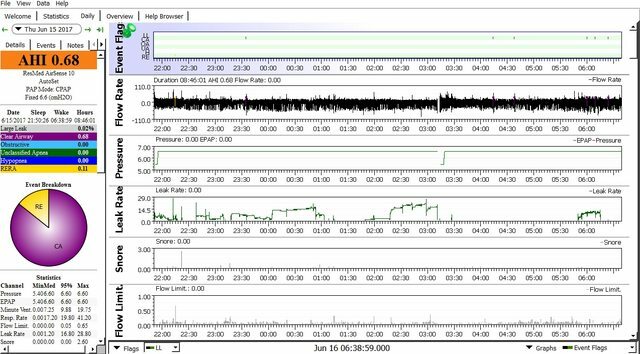 We need to see a zoomed-in section of Flow Rate during a time of high leaks. From the leak graph alone, I would suspect mouth breathing. My sleep improved a LOT once I started taking Vitamin D (along with A and K to keep things in balance). I took 14,000 IU a day for a few weeks then tapered down to 4,000 - 5,000 once I got the levels up. Google for Dr. Stasha Gominak. She has some good information on this. RERA are events that make you awaken (slightly perhaps) but are not enough to score in AHI. Related to UARS.